The lighter side of orchestration is well catered for with Lumina, and it sounds gorgeous, but it needs updating to reach its true potential. Great recordings. Fantasy genre is particularly well catered for. Choirs sound a bit synthetic. Annoying programming. 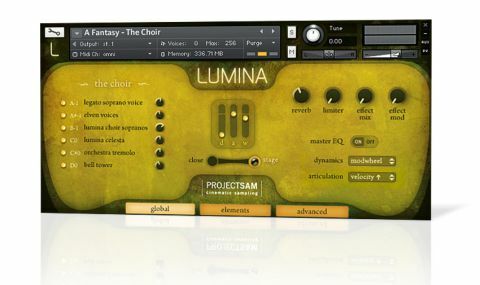 The third in the Symphobia series, Lumina (for Kontakt 5 or the included Kontakt 5 Player), focuses on the fantasy and mystery cinematic genres with legato instruments, textures and pre-recorded phrases. "The recordings are breathtaking, blending seamlessly with its sibling packages"
The recordings are breathtaking, blending seamlessly with its sibling packages. The ensemble phrases are lush and the single instruments (recorders, harp, whistles, etc) have a sound straight out of Middle Earth. Sadly, the choirs and soloists sound a bit flat and synthetic, and the odd selection of cartoon patches might be better suited to a standalone library. Some annoying programming also mars an otherwise stellar package: the phrases can't be automatically tempo-synced within Kontakt, articulation can be illogical, and the keymapping could do with tweaking.